← Ask the Blonde Coyote: What do I need to hit the road? When I was a kid, my Uncle Frank gave me a jar of ash from the 1980 eruption of Mount Saint Helens. 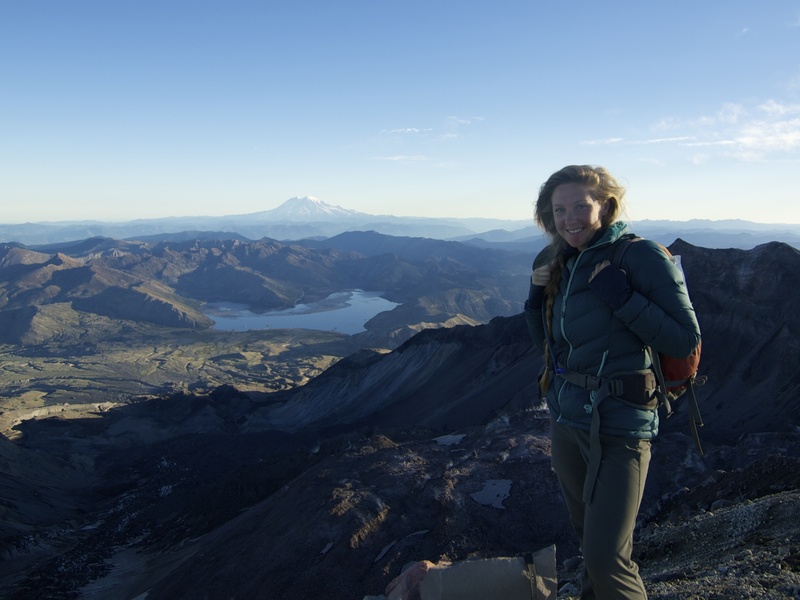 I wasn’t born yet when the mountain blew its top, but that jar of fine grey powder – scooped off a car hood in Oregon, hundreds of miles away from the mountain – kickstarted my lifelong fascination with volcanoes. That jar still sits on a shelf at my parents’ house and Mount Saint Helens has long been on my wish list of mountains to climb. 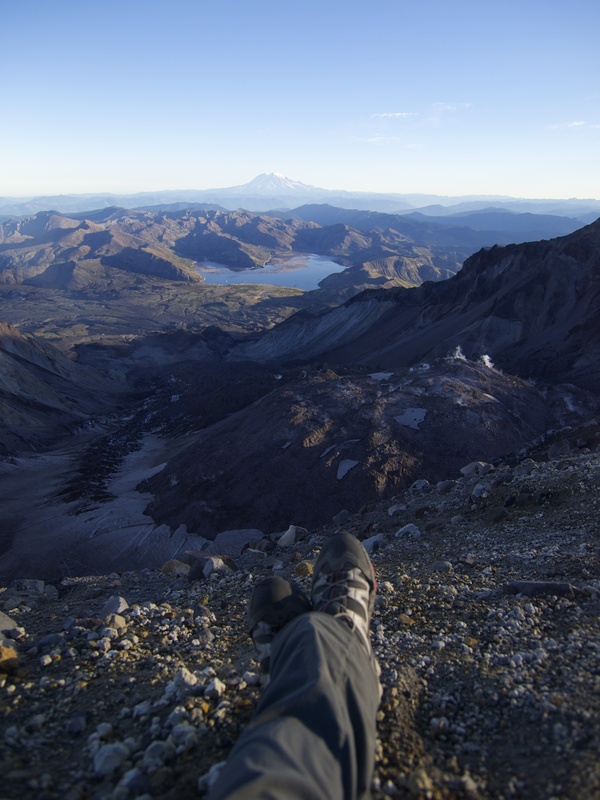 I tried several times this summer to get a permit to climb Helens, but the park service only gives out permits online (not in person) and they tend to sell out months ahead of the summer climbing season. This kind of system really annoys me. I feel like if you show up at a mountain, ready to climb, you should be able to get a permit. 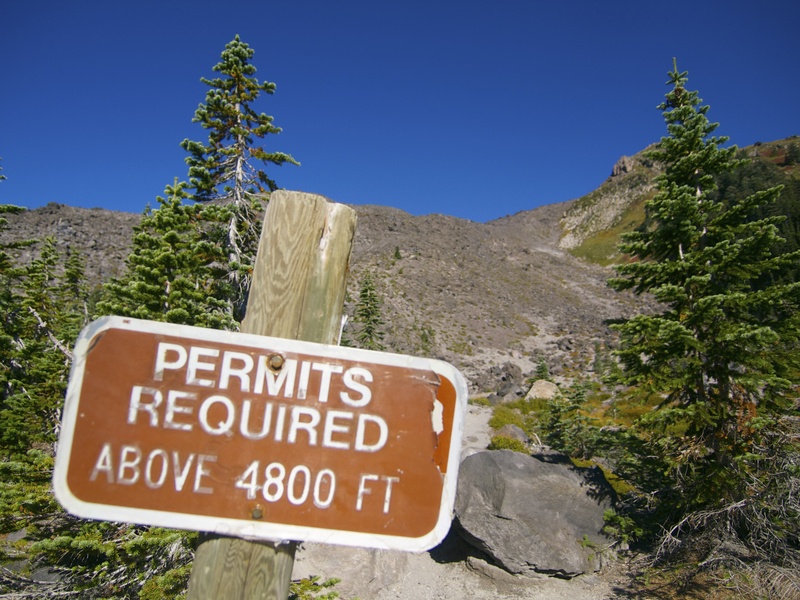 You can also buy permits from people who are backing out of their climb through purmit.com, but you have to go meet them in person to pick up a piece of paper before heading to the mountain. Those logistics are ridiculous. 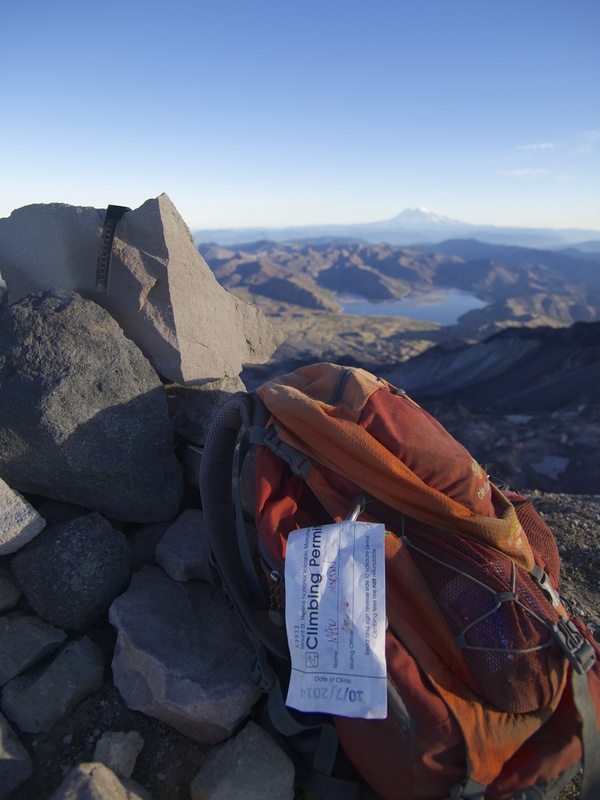 Another annoyance about the Mount Saint Helens permit system: you can only pick up your permit the day before your climb. This means that my friend Joe, whom I met earlier this summer on the way up South Sister in Oregon, couldn’t hike the 3-day, 28-mile Loowit trail around the mountain and then summit it. He would have to do the Loowit trail, drive into town, pick up his permit and then return to the mountain to climb it. Again, ridiculous! Joe’s solution was to hike the Loowit trail, have me pick up his permit in Cougar, Washington and meet him at the trailhead the night before our climb. Fortunately, the permit limits are only for the busy summer months and after October 1st, you still need a permit, but they don’t sell out so I didn’t have a problem getting two. On the way to the mountain, I noted a full moon was due that night and I wondered if Joe would be up for moonlit summit. Sure enough, he was wondering the same thing about me. The best place to meet real fellow mountain people is in the mountains. My permit on my backpack on the summit. Our alarms went off at 3:30am and we were on the trail by 4. Joe said he thought he heard another group get out before us and sure enough, we caught a few glimpses of headlamps higher up on the mountain. With the full moon, our flashlights weren’t all that necessary, but the going was rough – a class 3 boulder scramble – and the extra light helped a lot in finding the most efficient route up the mountain. Good Morning! Sunbeam across the Shoestring Glacier. 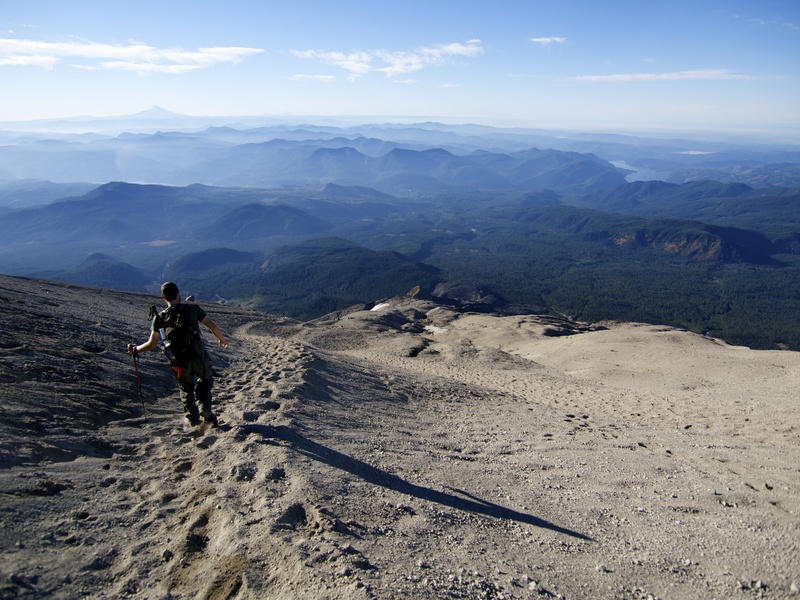 Climbing a mountain in the dark reduces the task to a more manageable size. You can’t see the route above you; you can only focus on your next few steps. Helens has a reputation for being a tedious slog, but in the dark the seemingly endless boulder field felt delightfully gymnastic. 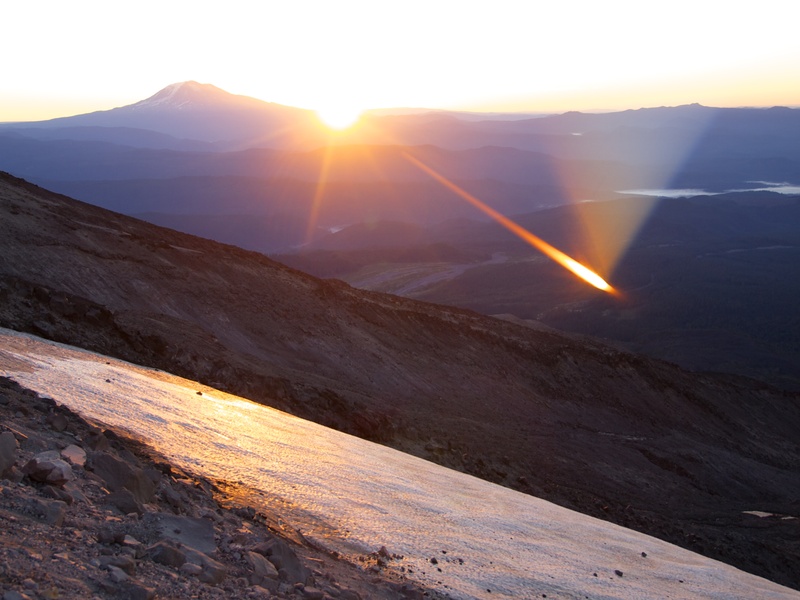 We climbed fast and caught the group ahead of us on the final approach to the crater rim, just as the sun rose over Mount Adams to the east. 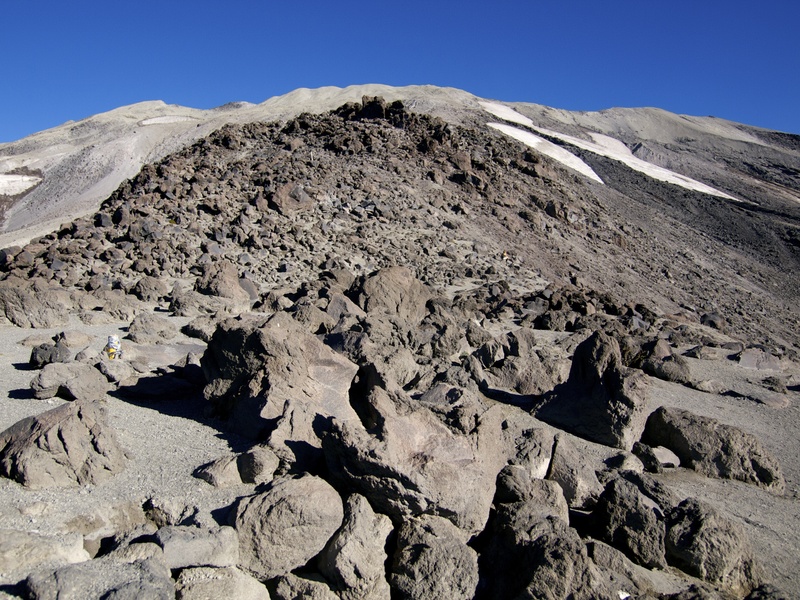 The final thousand feet of elevation were up loose, ashy rock – here was the slog we’d heard about – but then we topped out on the crater rim to an incredible sight. We were on the south side of the crater, looking across to the north wall, or what used to be the north wall, now known as “The Breach”. The entire side of the mountain was gone, blasted away, the debris field scattered downslope into Spirit Lake, the murky waters still choked with downed trees. 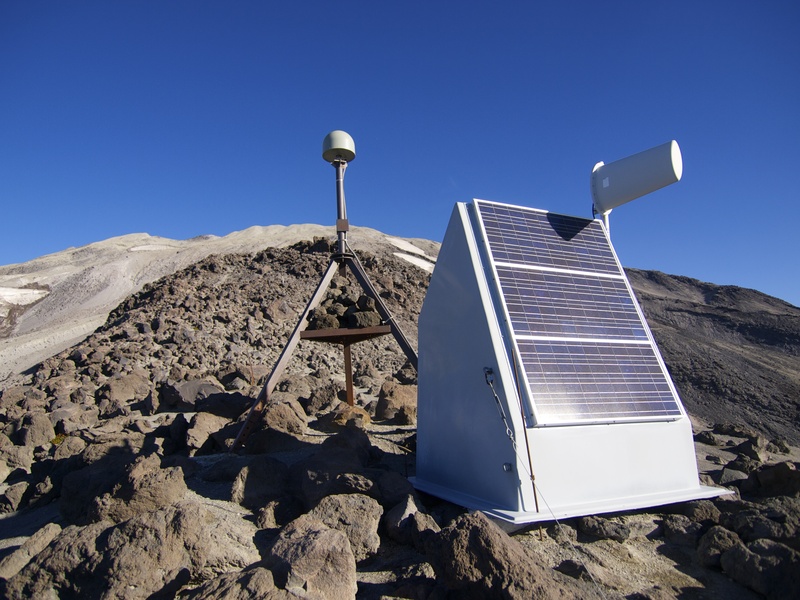 Smoke rose from the dome of loose rock on the crater floor and the smell of sulfur was strong. This was no inanimate pile of rock we were climbing; this was a living, fire-breathing volcano! 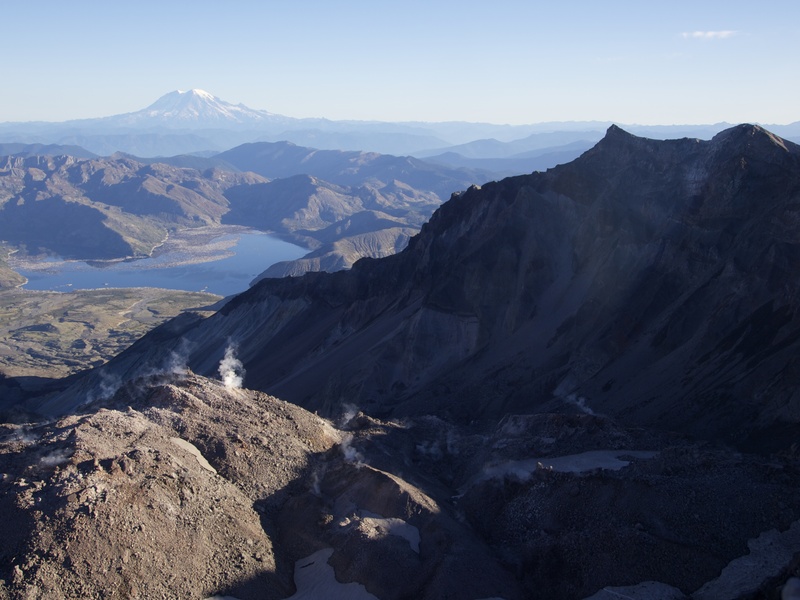 We tightroped to the west along the narrow catwalk of the crater rim, the loose rock dropping off vertiginously on either side; this is where people get into trouble on Helens. 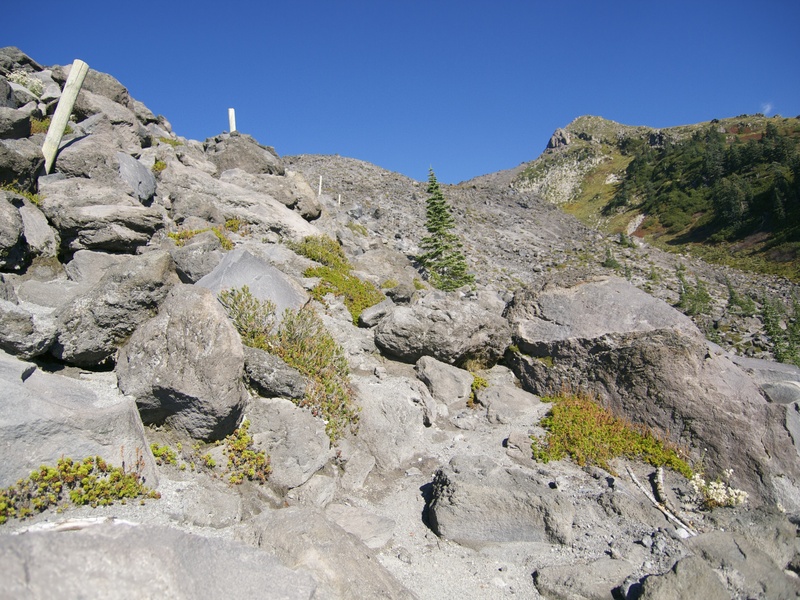 The path dipped down then climbed a few hundred feet back up to the summit, marked by a pile of rocks. There we rested, the entire crater to ourselves. Joe told me all about his three-day trek around the mountain, stumbling through the blast zone, still fresh with loose, barely weathered rock; thirty-four years is not long in geologic time. What a feat to circle a mountain and then climb it! I’ll have to put that on my to do list. Sitting there on the rim, I felt a faint rumble. Did you hear that?! – Joe and I asked each other, wide-eyed. Sure enough, the mountain was muttering, murmuring, reinventing itself right under our feet. Never in all my summits have I heard a mountain make noise like that! 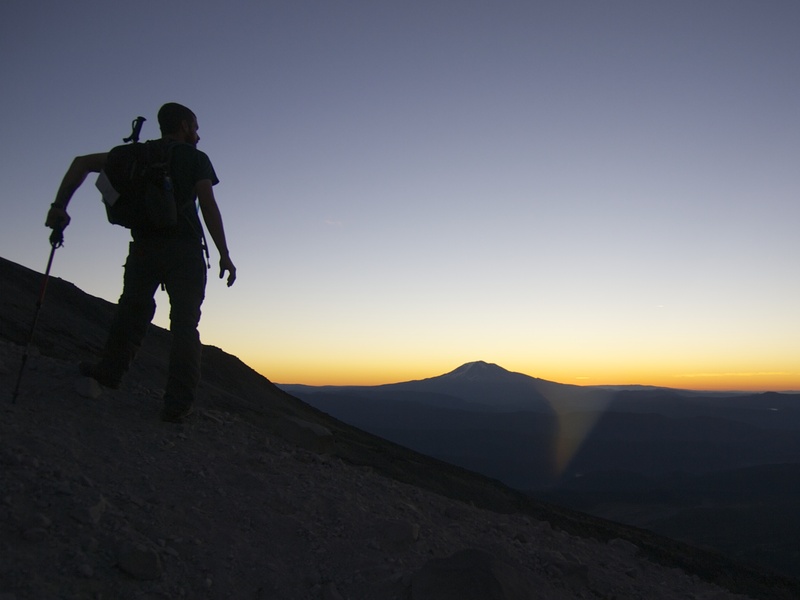 At 8,366 feet, Mount Saint Helens isn’t all that tall, but it’s a living, breathing beast of a mountain. 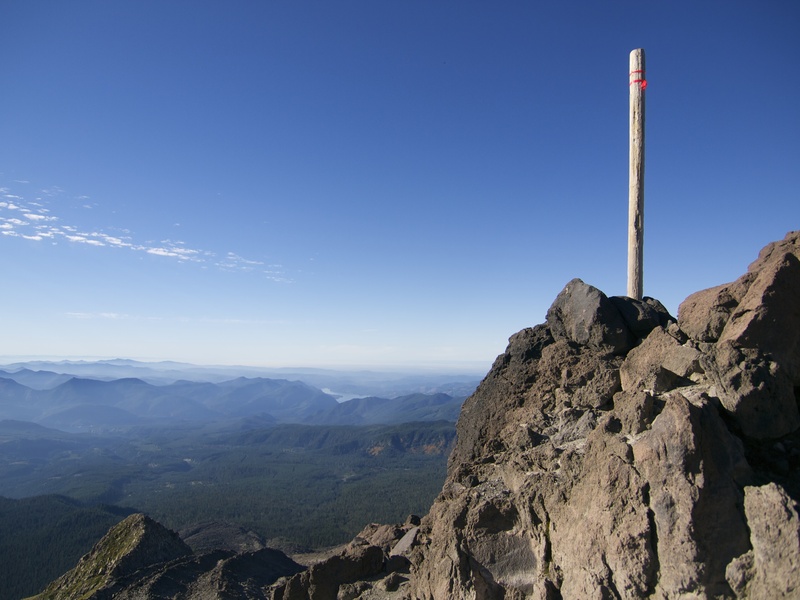 One of the trail markers up Helens. The route was a little hard to follow in the dark but we stayed mostly on track. My summer of mountains is wrapping up, and now I’m heading back to the desert! Stay tuned for a few dispatches from Utah! 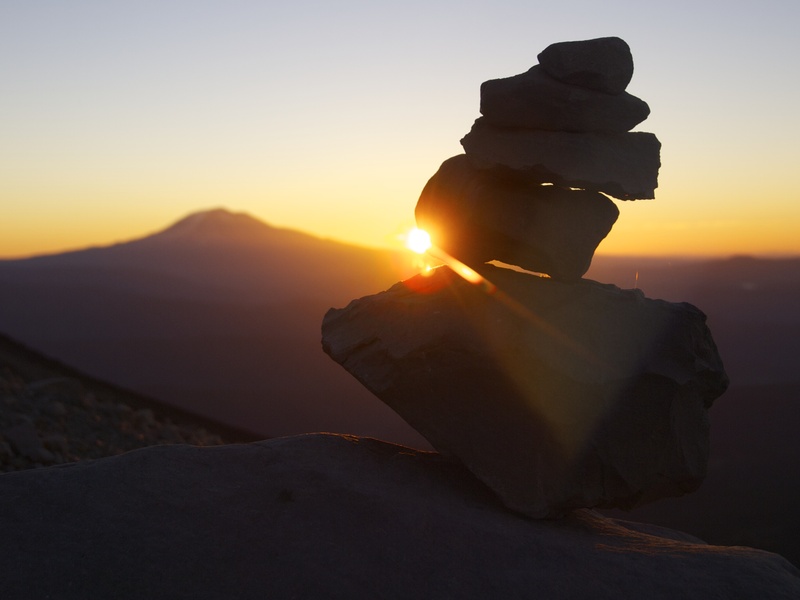 Check out my other Cascades posts here: South Sister, Mount Thielsen, Mount Adams, Smith Rock. I enjoy these posts so much! You are like the Mars rovers Spirit and Opportunity, landing on worlds I will most likely never be able to set foot on, but I will know through the lens of your camera and the strength and generosity of your spirit. Beautiful photos! Onward! Nice post. Hike/Climb half dome in Yosemite on a summer weekend and you might see some reason for permits. I was there several years ago. Permits weren’t required. I’m not sure if they are now but it’s pretty dangerous with all the traffic trying to go up and down the same ropes simultaneously. Our trip up was fine, but on the way down there was a mass of humanity all over the place. The line to even get on the ropes was a half hour wait. Many people were coming down the outside of the ropes in order to avoid people. It’s a wonder more people don’t fall to their death under these conditions. I was a mail carrier in Hood River when St. Helens erupted. HR is south and east of the mountain. We got dusted pretty good on several occasions. More than once we delivered the mail wearing masks. It wasn’t until 2012 that I finally visited the National Monument. My wife and I climbed Windy Ridge and hiked a trail near Spirit Lake, which can be seen behind you in the Happy Helens Photo. You haven’t posted in awhile. Hope all is ok.